Past Chairman, Nigerian Insurers Association, Eddie Efekoha; Chairman, Tope Smart and past Chairman, Godwin Wiggle at the event. The Chairman, Nigerian Insurers Association (NIA) Tope Smart, has pledged to redeem insurance sector image and position it to contribute maximally to the economy. 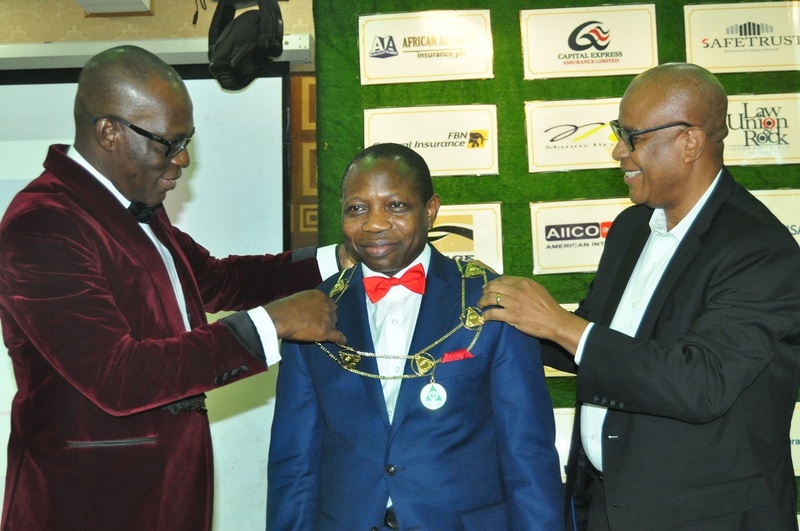 Smart, who disclosed this at his investiture as the 23rd Chairman of the association in Lagos, said he hopes to achieve the dream through a theme tagged, NIA First, Insurance First. He expressed worry that the industry is not where it supposed to be, stressing that the industry’s image has been battered and more often than not, the sector has been made to play a second fiddle to some other professions. “Our image has been battered and more often than not, we have been made to play a second fiddle to some other professions. I say enough is enough, to this treatment. It is in the light of the above that I have adopted a theme NIA First, Insurance First,” he said. The NIA Chairman, who is not also comfortable with the poor level of insurance penetration and had set 5-point agenda to reposition insurance business, noted that the Nigerian Insurance Industry is a key component and an important member of the Nigerian Financial Services Sector. “Insurance as we all know is the bedrock of any economy. In Nigeria, it is rather sad to note that not all have embraced this concept. This is why the penetration rate still remains about .5 per cent as against some other African Countries such as Kenya and South Africa with penetration levels of 2.9 per cent and 14 per cent respectively. Also only 1 per cent of our population hold any form of Insurance Policy. “The reason for lack of interest in insurance may be as a result of lack of knowledge about the benefits of insurance. Let me therefore, use this opportunity to highlight some of the benefits of insurance to the economic growth of our nation and indeed the entire world at large,” he posited. According to him, in the next 2 years, he had decided to focus on 5Ps, which include, protection of interest of members companies; proper positioning of the insurance industry; Improve the standard of professionalism; put in place a befitting edifice for NIA and deepen insurance penetration. He called for deployment of good technology to drive insurers’ operations, development of human capital, reaching the unreached as well as setting and working towards a financial inclusion target for the industry. Urging operators to put in place, an excellent customer satisfaction mechanism, increase insurance awareness through many channels and build capacity for the industry in a bid to properly position the industry. According to him, the level of professionalism in the industry is very low compared with global best practice as the rates charged, more often than not for risks presented for insurance, do not correlate with such risks. Noting that there is the need to have a total departure from unethical practice, he added that risks survey, inspection and business procurement procedure are, most times, relegated to the background, saying, these need to be addressed to take the Industry to the next level. NIA, he said, will collaborate with all other stakeholders in the Industry to tackle these various issues. He promised that NIA , under his leadership, will work with all arms of the industry such as Brokers, Chartered Insurance Institute of Nigeria(CIIN) and the National Insurance Commission (NAICOM) to increase insurance penetration in the industry. Moreover, insurance stakeholders at the event expressed their optimism that Tope Smart, who is also the Group Managing Director of NEM Insurance PLC, is the right man to lead the industry in a bid to reposition the sector for the better, especially, in the current harsh business operating environment.